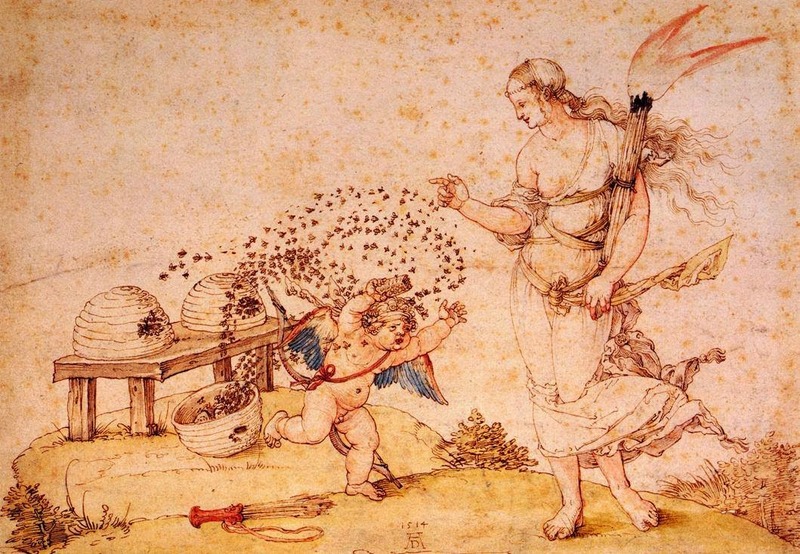 Honey is such a natural wonder, but did you know how versatile it is as a culinary ingredient? As part of the National Honey Board’s ongoing education program, we’ve partnered with Chef David Guas to show how versatile honey is in the kitchen. 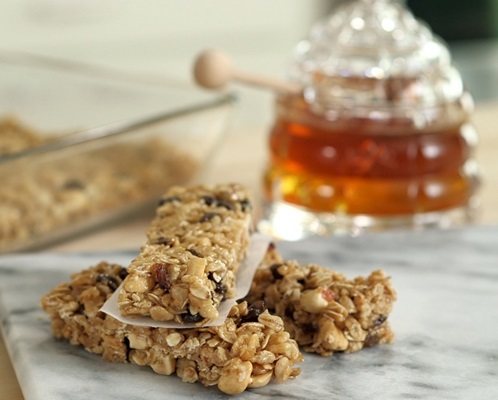 Everything from a natural humectant to a sweet substitution in baking and beverages, we emphasize how honey can be incorporated into your everyday menu. For the salted honey crumble: In the bowl of an electric mixer fitted with the paddle attachment, combine the brown sugar, butter, clover honey and vanilla; beat on medium-high speed until light and fluffy, about 2 minutes. Add the flour and salt. Mix on low speed just until the mixture comes together and develops a sandy texture. Refrigerate in an airtight container for at least 30 minutes. For the muffins: Preheat oven to 350 degrees. Butter 12 muffin cups and dust with flour. In a small bowl combine the flour, baking powder and salt. In the bowl of an electric mixer fitted with the paddle attachment, cream together sugar, butter, honey and vanilla. Add eggs one at a time and mix well; stir in milk. Add the dry ingredients and mix just until combined. Remove the bowl from the mixer and gently fold in blueberries using a rubber spatula. 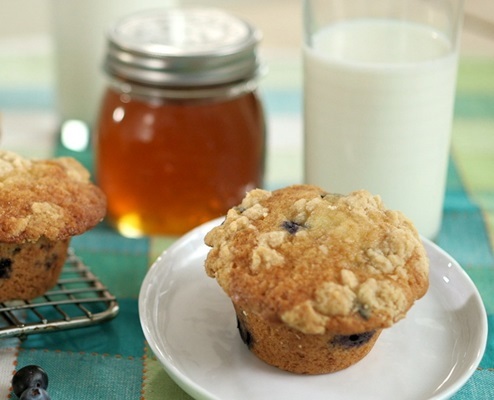 Scoop the mixture into the prepared muffin cups, filling them about three-fourths full. Sprinkle each top with 1 tablespoon of the salted honey crumble. Bake on the center rack of oven until golden, about 30 to 35 minutes. Line the base of a 9-by-13-inch pan with parchment paper and spray generously with cooking spray. In a large bowl combine the oats, crispy rice, peanuts and raisins; stir to combine. Set aside. In a large, 2-quart saucepan combine the brown sugar, honey, butter, peanut butter, vanilla and salt. Bring to a boil and cook, stirring with a wooden spoon, over medium-high heat, until the mixture reaches 220 degrees on a candy thermometer. Immediately pour the hot liquid over the oat mixture, stirring until all of the dry ingredients are coated. Transfer the bar mixture to the prepared pan and press into place using your hands. Chill in the refrigerator for about an hour. To serve, cut into half lengthwise; then horizontally into twelve 2-inch bars. Pour boiling water over the hibiscus, cover and allow to steep for 30 minutes. 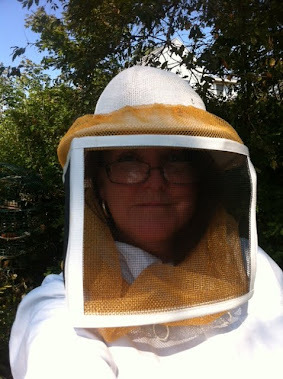 During this time, make the orange blossom honey syrup: in a small saucepan, slowly bring honey and water to a boil. Remove from the heat and allow to cool (this can also be made ahead of time and refrigerated until use). Strain the hibiscus tea base into a 2-quart pitcher; add the orange blossom honey syrup, orange juice and cold water; stir until dissolved. To serve: Pour 10 ounces of the punch into a cocktail shaker half-filled with ice cubes and 2 to 3 mint leaves; close tightly and shake. 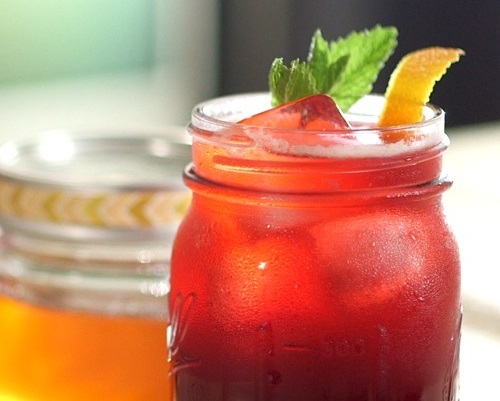 Pour into a tall glass; garnish with orange peel and fresh mint leaves. Serve immediately. In a shallow dish, combine the honey, orange zest, orange juice, olive oil, five-spice powder, garlic and salt. 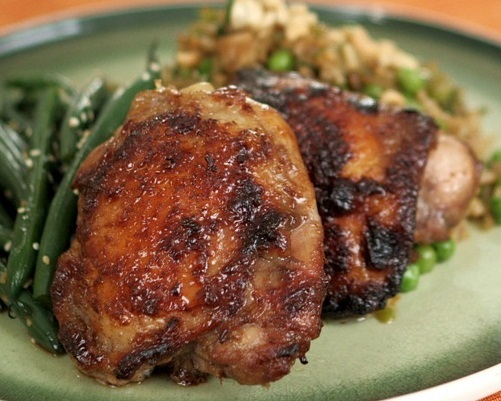 Toss the chicken thighs in the marinade, taking care not to pull away the skin. Cover and refrigerate for one hour. Preheat the oven to 350 degrees. Heat a 10-inch cast iron skillet on medium-high heat. Add the oil and swirl to coat. Add the chicken, skin side down; cook until a rich mahogany color, about 3 minutes. Using tongs carefully flip each thigh; transfer the skillet to the oven and cook until the juices run clear and the meat is fully cooked, about 18 minutes. Transfer the thighs to a cutting board and allow to rest for 5 minutes. Serve with fried rice, wasabi-whipped potatoes or Szechuan green beans. Place salmon filets skin side down in a 13-by-9-inch baking pan. Pour enough olive oil into pan to completely cover the salmon. Sprinkle with the sliced shallots and lemons, pressing them down to submerge them in the oil. Cover pan tightly with aluminum foil; bake until firm to the touch, 30 to 35 minutes. Allow to cool in the oil. Using a metal spatula, remove from the oil (reserving 1 tablespoon), cover and chill in the refrigerator for at least 30 to 45 minutes. In a medium bowl toss the arugula, salt and the reserved olive oil. To serve, divide the greens between four plates. 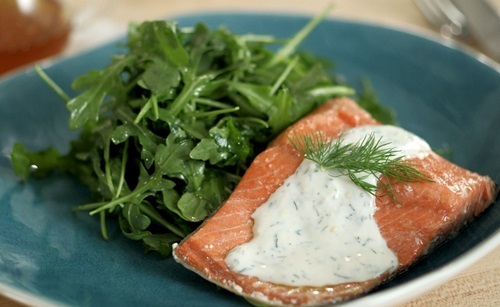 Top with chilled salmon and coat with ¼ cup of the honey-yogurt dressing (recipe follows). Serve immediately. For the honey yogurt dressing: In a medium bowl combine the yogurt, dill, honey, lemon juice, salt, lemon zest and mustard; whisk together. Cover and refrigerate if not using right away. You can make the honey-yogurt dressing a few days in advance if kept in airtight containers. 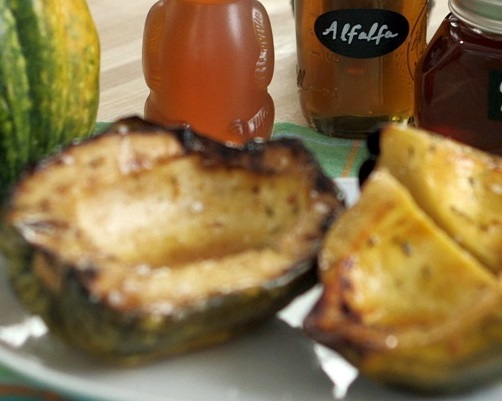 Cut each acorn squash in half lengthwise and, using a metal spoon, scoop out and discard the seeds and any pulp. Pour 1 cup of water into a 4-inch deep ovenproof pan; arrange each squash, cut side up, snugly on top. In a small bowl stir together ¼ cup sage honey, 1 tablespoon of water and salt; brush the cut side of each squash with the honey solution, making sure that all of the honey solution is used. Cover the pan tightly with foil and bake for 30 minutes. While the squash is cooking, make the sage honey butter. Heat a 6-inch sauté pan over medium heat until hot; add the butter and swirl until foaming; cook until nutty brown in color. Remove from the heat and immediately add ½ cup sage honey and the sage leaves, stirring well. Set aside. Remove the foil from the squash and bake for another 15 minutes or until golden and tender when tested with the tip of a knife. Transfer the squash to a serving platter and spoon the sage honey butter on top, then sprinkle with Fleur de Sel or Maldon salt. Home-style Honey Crust: Preheat the oven to 325 degrees. Melt the butter on the stove top in a small saucepan. Mix the dry ingredients in the bowl of an electric mixer. Add the honey, water and vanilla, and mix using the paddle attachment. Mix on low until dough forms (more water may be needed to form dough– add ½ teaspoon at a time until dough comes together). Remove dough from mixer. Using your fingers, gently press the dough evenly into the bottom and up the sides of a 9-inch pie or tart pan. Bake for 15 minutes for a pie pan or 7 minutes for a tart. Cool completely. While the crust is cooling, prepare your cheesecake filling. Cheesecake Filling: Submerge gelatin sheets in a bowl of ice water and allow the sheets to soften or “bloom” (approximately 5 minutes). Place cream cheese in a metal bowl above boiling water and let it melt, stirring occasionally. In a large mixing bowl, combine sour cream, honey, vanilla bean seeds, heavy cream and salt. Whip using an electric mixer with a whisk attachment until soft peaks form. Remove the cream cheese from heat. Squeeze excess water from softened gelatin sheets and whisk gelatin into cream cheese. Add approximately ½ cup of the whipped sour cream mixture into the cream cheese mixture and whisk until smooth. Using a rubber spatula, gently fold in the remaining sour cream mixture into the cream cheese mixture. To assemble, scoop the filling into prepared pie pan. Refrigerate uncovered for at least 2 to 3 hours before adding any desired topping. Cheesecake can be refrigerated for 2 to 3 days. 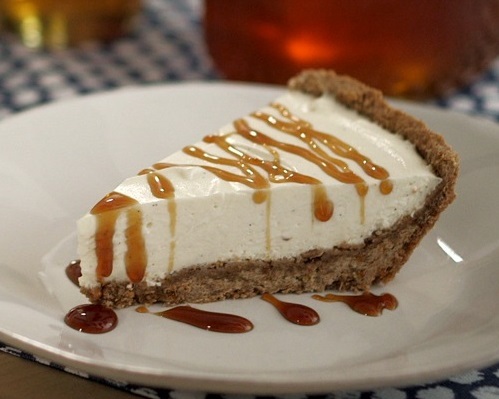 Optional: For presentation and to contrast the cheesecake flavors, drizzle a darker honey such as buckwheat on top.